Hearing Sugarwork (the album) was a revelation. Comprised of four musicians I go out of my way to listen to whenever I can, a couple of years ago I saw Sugarwork (the band) at an early gig of theirs, and their music left me cold. Well, this CD disabused me of any preconceptions I had: they have recorded an album of compelling, startling music, unlike anything else on the current jazz scene in Scotland. The nearest touchstone might be Polar Bear, crossed with the early solo work by Reid Anderson, the bassplayer with the Bad Plus: a dark, heavy sound coupled with a distinct groove and intense, melodic improvisation. 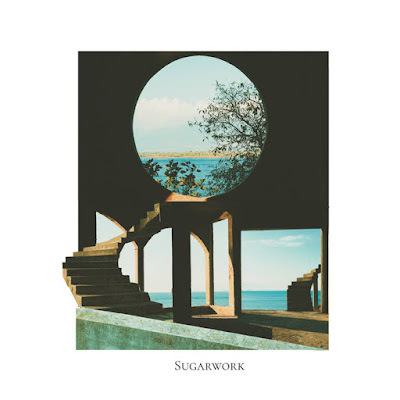 Sugarwork is the brainchild of Paul Harrison, who wrote most of the tunes, provides the keyboards and produced the record, though he seems content to let others take the limelight: his keyboard work seems mostly to be about adding texture. Much of the melody comes from the tenor sax of Phil Bancroft and guitarist Graeme Stephen, with all of the quartet providing the groove – though particularly drummer Stuart Brown. Without a bass player, it is Harrison and Stephen who add the bass parts when needed, using loops and programmes. The result is a synthesis of electro-groove and improvisation, often in surprising combinations. After The Forest, The Sky starts with long, slow notes from Stephen, Harrison and Bancroft; then Brown explodes the serenity with fast beats, propelling the tune as of it were 1990s "drum and bass" as Bancroft's saxophone screams in the upper register. The tune closes with just saxophone and piano, an almost classical jazz combination – the sky, perhaps – itself shocking after the fury that precedes it. Stephen's tune Goodbye Hello works in a different way, slowly building its intensity bit by bit until it is almost too much to take. Bancroft's saxophone grows more and more impassioned, wailing over Brown's loud crashing cymbals. The crescendo is followed by a gentle coda, with Stephen's treated guitar accompanying a gentler but no less inventive saxophone. Nearly a quarter of the record is taken up with Astraglia, a long, extended piece of three sections which develops from a simple structure an almost train-like rhythm, the locomotive force of Brown's drums pushing forward the groove whilst Harrison, Brancroft and Stephens blow over the top. It ends with an eery, synthesised sci-fi dub. This is quite a dark record, brooding in places and suffused with melancholy, which serves to emphasise the sunnier sections. It mixes jazz with electronics and a range of rhythms and beats, creating a new lively sound. Sugarwork is released tomorrow. Available now from https://sugarwork1.bandcamp.com and other download sites.